*Indicates objects flown on the Apollo 11 mission. Columbia is the only part of the Apollo 11 spacecraft to return intact to Earth. It carried the crew, equipment and precious lunar samples through a fiery reentry into the Earth’s atmosphere. The hatch served as the entry and exit point to the spacecraft on the launch pad and after landing. It could also have been used for an emergency transfer from the lunar module Eagle if docking failed. The chart shows the positions of the sun, moon and stars at the time Apollo 11 was scheduled to leave Earth orbit and head for the moon. Astronauts were issued sturdy metal Garland 35-P mechanical pencils for taking notes and making alternations to flight plans. NASA purchased for astronaut use “Rocket” model felt-tipped markers for taking notes during the mission. Some of the notes were written on the spacecraft walls and control panels. The pen has a small Velcro tab to secure it in weightlessness. The kit contains medical supplies and equipment, including motion sickness injectors, pain suppression injectors, first aid ointment, eye drops, nasal sprays, compress bandages, adhesive bandages and an oral thermometer. Pills included antibiotics, anti-nausea, stimulants, painkillers, decongestants, anti-diarrheals, aspirin and sleeping aids. One of two rucksacks filled with equipment to help the crew survive for up to 48 hours in the event of an emergency landing somewhere on Earth. 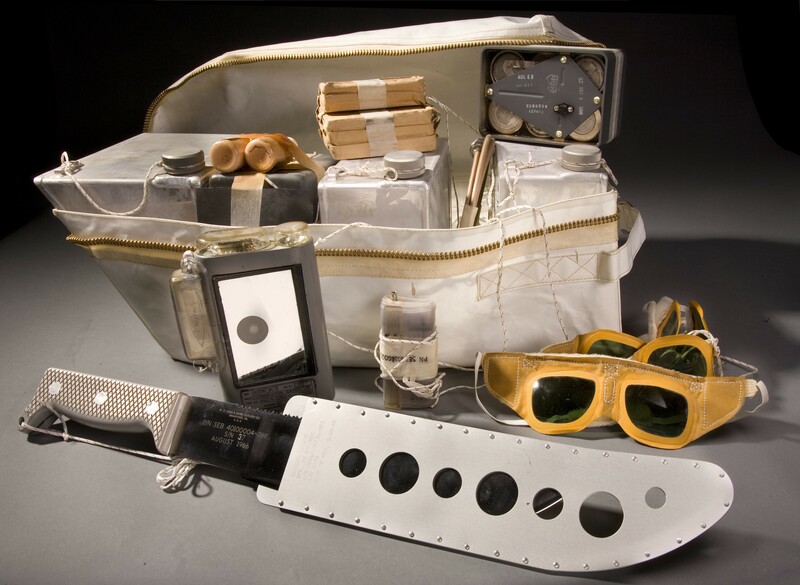 The kit includes three water containers, a radio beacon and spare battery, three pairs of sunglasses, six packages of desalting chemicals, a seawater desalter kit, two survival lights, a machete and two bottles of sunscreen. The “rock box” was one of two used to bring back the very first samples of the moon to Earth—47.7 pounds (21.8 kilograms) of lunar material from the Sea of Tranquility. Buzz Aldrin wore this outer helmet while on the surface of the moon. It fitted over his clear pressure-bubble helmet. These gloves have an outer, cut-resistant shell of Chromel-R fabric across the hands to prevent fatal air leaks caused by handling sharp objects and gauntlets to protect against solar heating. The blue fingertips were made of silicone rubber to provide more sensitivity for touching. The lunar module Eagle was equipped with this star chart. It was formulated to assist pilot Buzz Aldrin when he used the lunar module’s telescope to precisely reset the module’s guidance platform shortly before liftoff from the lunar surface. Michael Collins wore the Speedmaster Chronograph during the Apollo 11 mission. The Velcro strap allowed him to attach it on the outside of his spacesuit during launch and reentry. The Solo Book contains consolidated instructions, flight plans and contingencies for Collins while he tended Columbia alone while Neil Armstrong and Buzz Aldrin descended to the lunar surface. The model shows the various production stages including substrate material, coatings, structure and curing of the heat shield that protected the command module from the extreme heat of atmospheric reentry. This heatshield sample, made of Avcoat 5026-39 and fiberglass, has not undergone ablation, the erosion of heatshield material during reentry. A piece of a heatshield from an Apollo command module flown on a suborbital test in 1966 shows how the filling material was eroded, forming a gray ash, by the intense heat of reentry. Part of the first-stage engine from Apollo 11’s Saturn V rocket, the injector plate, recovered from the bottom of the Atlantic Ocean in 2013, sprayed liquid oxygen and kerosene fuel into the combustion chamber and helped regulate the flow of the hot gases.